One thing I love about cities, is that you can find something surprising around every corner and on every side street. I had planned on having lunch with a friend at a Vietnamese restaurant in Nice, but it was closed for some reason. So, due to this twist of events, we ended up walking down rue Dalpozzo and came across “La Milanesina,” a family run, Italian Restaurant (2, rue Dalpozzo). The lovely, interior decoration and friendly ambiance immediately pulled me in. 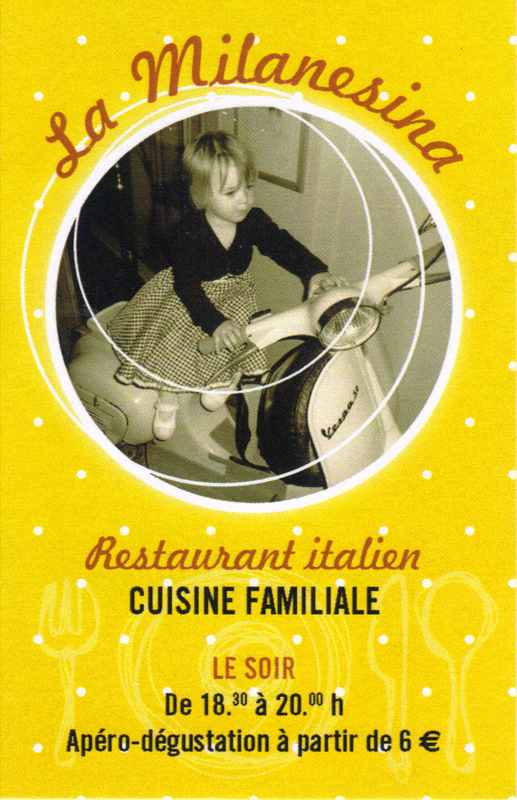 It soon became quite obvious that this place was family run, as the chef is the mother of the waiter, speaking Italian together. I ordered one of the “plat du jour”: a ham & cheese omelette, but asked to have it without the ham. What shocked me next was the waiter asked if I wanted something in its place – huh? In all my years in France, when I have ordered something without an ingredient in a French restaurant, no one has offered a substitution. I asked what he had in mind, to which he then asked the chef, and responded “courgettes” (zucchini) – delicious. The service was polite, friendly, and accommodating — yes, you read correctly — accommodating to the client! I personally thanked the chef and asked how long they had been open (2 years); she understood, but did not speak a lot of French. Their appreciation for our patronage was indeed heartfelt and conveyed – in the end, I was happy the other restaurant had been closed. This entry was posted in Restaurants / Food & Drink and tagged cuisine, food, France, French Riviera, Italian restaurants in Nice, Nice, restaurant, restaurants in Nice, travel, Travel and Tourism, wine. I will definitely have to try this one. I love France, but there aren’t many establishments here that can be described as “accommodating” – just that makes me want to go. 🙂 Of course I love Italian food too so it sounds like a winner all the way around. Thanks for sharing your “find”. You’re welcome – I hope your dining experience will be as enjoyable as mine & bon appetit! An incredible French story. I have my own omelette story. There were 2 omelettes on the menu: cheese, and fine herbs. We asked for both. Mon Dieu, a sacrilege!! Certainly not! Thanks for the restaurant recommendation, I will check it out. One of each omelette sounds good to me -:) Looking forward to catching up with you next time you’re here! Absolutely – come on down! Merci for commenting, Rommel – Italian dressing is delicious too!